Birmingham Airport is "highly likely" to be targeted by terrorists using drones to try to bring down aircraft, an expert has claimed. Prof David H Dunn, of the University of Birmingham, said there was a growing risk of extremists using the flying devices to try to crash into the engines of planes taking off. And he said powerful drones capable of bringing down an airliner were becoming increasingly widespread and could be bought by terrorists for as little as £500 - £1,000. Prof Dunn is author of a recent report, in collaboration with Sir David Omand, the former head of GCHQ, which called for "urgent" measures to protect British airspace from attack. The calls follow a near miss when a drone flew within 20ft of a packed Airbus A320 as it landed at Heathrow Airport in July. According to Prof Dunn, the best way to carry out a deliberate attack would be to try to co-ordinate a "screen" of drones on the flightpath which the pilots would not see until too late. He revealed the location of Birmingham Airport made it ideal for such an attack. Prof Dunn said: "There are three things which make Birmingham Airport a target for a terrorist drone attack. "First, it is in quite a rural location, so that anyone controlling the drones could make a quick getaway – somewhere like Heathrow you&apos;re surrounded by things like the M25. "At Birmingham the flight path is also beneficial – it goes directly over heavily populated areas so there would be a huge opportunity to cause the maximum number of casualties. "Finally there is also the fact that most of the jets using the airport have two engines – this makes them much easier to bring down than the bigger aircraft with four engines. "Taking all these together Birmingham has a large number of factors which, it might be said, make it highly likely to be attacked." The professor said the "robotics revolution" meant the use of drones was going to become increasingly widespread. He revealed farmers would use them to patrol their land, spot animals in difficulty, broken fences and crops needing watering. He explained technology advances meant they could be programmed to follow flight paths using global positioning systems. He added that simply crashing into aircraft was not the only way terrorists could use drones for an attack. One chilling scenario feared by Prof Dunn is a chemical agent sprayed on large gatherings of people using technology on farming drones normally used to spray crops. He said: "The same technology could be used to attack a large number of people in, for example, the Birmingham City stadium during a football match. "The terrorist could get the drone to hover over one section of the supporters and spray them with chemicals. "Another way of doing it could also be to use petrol and then ignite it – with so much vapour it would explode in a fireball." Prof Dunn believes the UK should introduce anti-drone defence systems at airports. 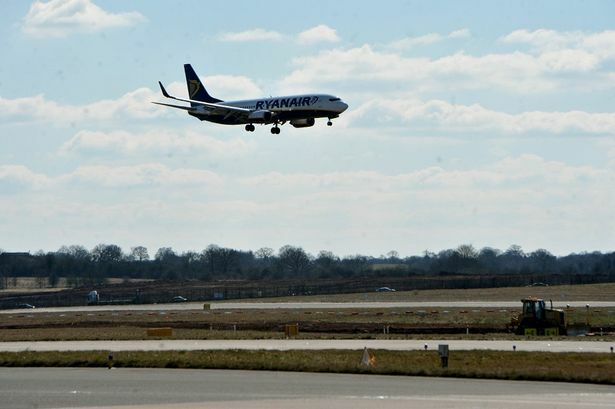 A spokeswoman for Birmingham Airport said air security issues were a matter for the Civil Aviation Authority (CAA). The CAA can prosecute people who fly drones to aircraft, crowds or buildings. A spokesman said the CAA&apos;s focus on drones was purely safety. He added: "If people have concerns about a drone being flown in public, they should call the police. "Local police can assess the situation in real time and, if there is any evidence of breaching the air navigation order, they will pass any information on to us." The European Aviation Safety Agency is developing EU-wide safety standards which it says will be as high as those for manned aircraft. The British Airline Pilots Association (Balpa) has called for police and the CAA to enforce the law better and has said larger, commercial drones should be as tightly regulated as manned aircraft. Jim McAuslan, Balpa&apos;s general secretary, said some form of registration and licensing scheme for drones and their owners – along the lines of the system already in place for model aircraft or motorised gliders – was "something that is going to have to be done" because so many people were buying drones.